About me .. – Craft-a-licious . . I retired on 1 April 2015, April Fool’s Day. I can’t believe I was a fool to work for so long – if I didn’t have to eat and pay bills I would have retired much, much earlier – but the necessities of life kept getting in the way. So, am now doing what many retired folk do – caravan around the country for a while, chasing the warmer weather, reflecting on life and my ever growing bucket list. 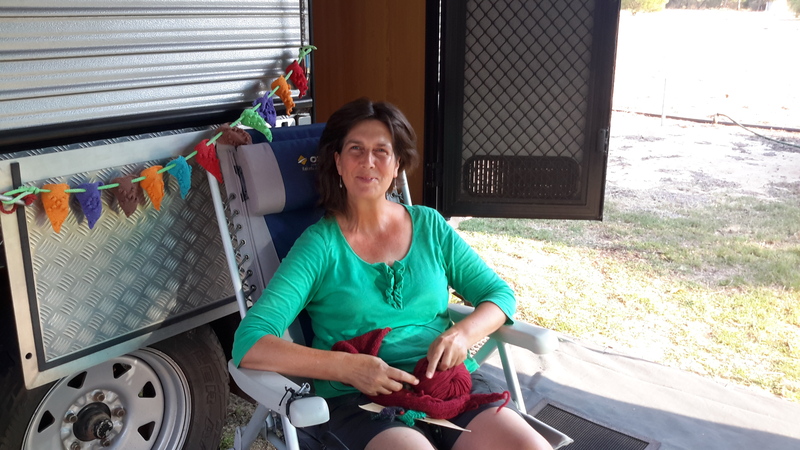 As my craft passion is bordering on the obsessive, when we arrive at any little outback town – I always try to attend that town’s craft group meeting, which is normally held weekly (usually on the day before I arrive, or just after I’ve left!). Doing this broadens both my craft skillset, and hopefully helps to broaden theirs as well. However a chat with like minded ladies while knitting with a good cup of tea accompanied with some local gossip is like a group hug for my soul. I really do enjoy them. Creating is a continuous learning experience. The more I know – the more I realize I don’t know. So the more I have to do. Most of it is around knitting and felting, mainly small(ish) objects, and I would probably achieve far more if I didn’t have a Pinterest addiction. Hey Cath, check your Facebook for a “blast from the past” photo. Mon. Hi Cath, enjoyed meeting you at Ayr Sailean & have been enjoying your blog! Dot passed on one of your cards 😉 Would have liked to have had more time there to get out the craft box there… Check out my FB page http://www.thetravelmakers.com for our eclectic mix of creations 🙂 Hope you’re in a beaut spot & greetings to Ralph. Sophie! What a wonderful surprise! Thank you so kindly for contacting me, I do hope you and your family are all well, happy and enjoying the travels – pls say hello to them from me. Thanks so much for sending me yr fb page so I can see what yr all up to! Fabulous stuff!! Hahaha! That’s a good idea, as Chester seemed to get just a touch of snobbery after wearing it.